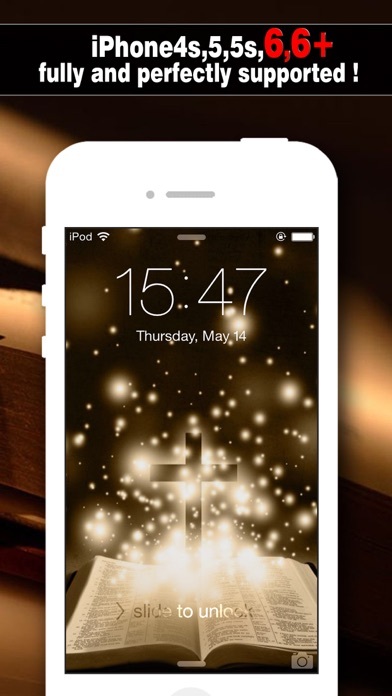 Bible Wallpapers is a great app to design Bible-based backgrounds and lock screen for iPhone. 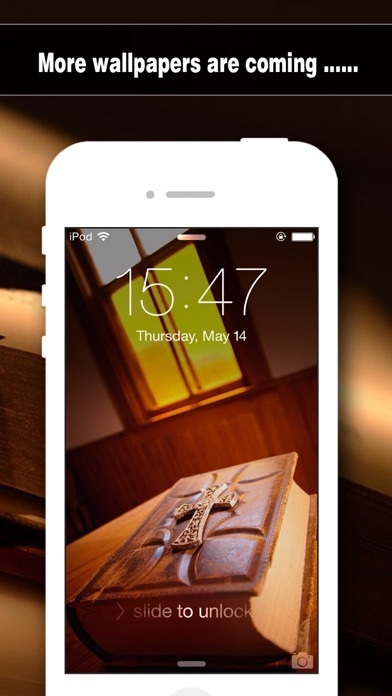 Put the Bible into your daily life and keep in mind what the Word of God says, every time you look at your device! It's very esay to use. Select a background or use your own photo. Customize font, colour, frame, shape and more. Besides, apply amazing filter effects on your artist work. ========== How to DIY: 1. 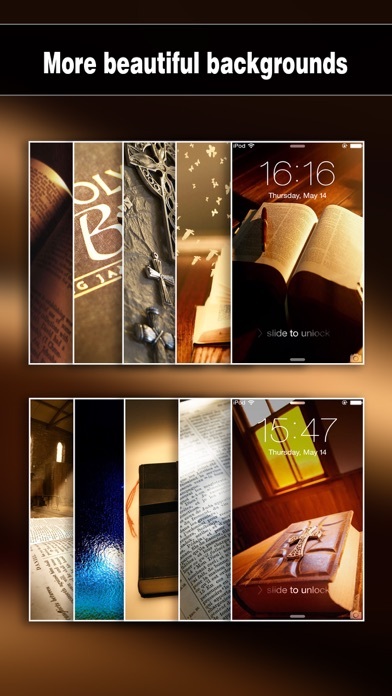 Pick an exquisite wallpaper from Bible Wallpapers or photo album. 2. Add shelves, icon skins or bars on the selected wallpaper. 3. Save it and set it as Home Screen or Lock Screen. 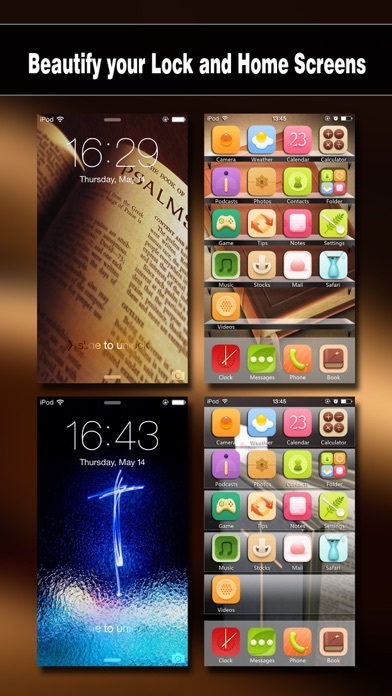 ========== Features: * Beautiful wallpapers. * Amazing filters. 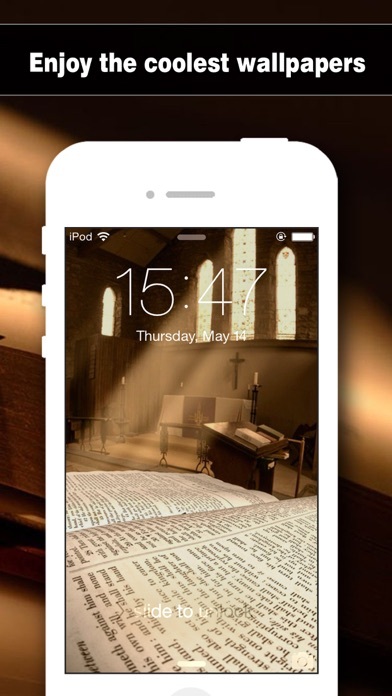 * Add shelves, icon skins or bars to make your wallpapers outstanding. * Blur your wallpapers to make it fantastic. * Instantly preview your custom wallpaper. This app is amazing and you can make you own or you can choose one that they have. You could also change so many things on your phone with this app. After I purchased it, the app won’t let me save the wallpaper designs to my photos. The screen pops up to give access but then it doesn’t actually save it. Seems like no customer support is being offered when I email them with the issue. This app doesn’t work. When I choose a wallpaper and click the file save button, nothing happens. When I go to check my photos for the wallpaper I just saved, it isn’t there. So, I think to myself.....Maybe it saves it in the wallpapers section, so I go to settings and then go into ‘set new wallpaper’ and look again in my photos and the wallpaper background I just saved and customized isn’t there! Frustrating! Look elsewhere! It shouldn’t be this difficult to save and apply a simple wallpaper! These pictures are Very inspiring to view and to help set the mood of your daily life in Christ. App is a blessing to have and a constant reminder of Gods grace.